The boy with the loaves and fishes is a popular Sunday School story, teaching kids about generosity. But the lesson shouldn't end there. In this colorful picture book, bestselling author Anthony DeStefano and award-winning illustrator Richard Cowdrey bring this miraculous tale to life and share a larger message with children of all ages. When kids, or their parents or grandparents, trust God with all they have, He can turn those seemingly small contributions into huge accomplishments to the glory of His kingdom. In the retelling of this boy's life-changing encounter with Jesus, kids will learn they can achieve amazing things when they believe in God. In addition, they will discover when they feel worried or anxious about doing difficult tasks, the Lord is there to help them when they ask. God loves all His children, young and old, and still works miracles every day! 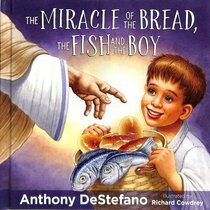 About "Miracle of the Bread, the Fish, and the Boy, the"
Anthony DeStefano is the bestselling author of Ten Prayers God Always Says Yes To, A Travel Guide to Heaven, This Little Prayer of Mine, and Little Star. He has received prestigious awards from religious organisations worldwide for his efforts to advance Christian beliefs in modern culture.